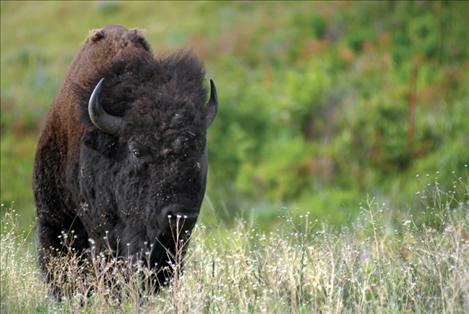 Visitors can view bison and other wildlife at the National Bison Range during fall hours. Black bears are still out foraging for food, and elk begin to bugle in September. It seems as though summer just started, and already we’re heading towards the Labor Day weekend, with fall just around the corner from there. However, this does not signal the end of the fun at the National Bison Range, only the start of some changes in hours of operation. This is reflected in the Bison Range’s new fall hours, which start on Tuesday, Sept. 4. The visitor center will be open daily 8 a.m. to 4 p.m. weekdays and 9 a.m. to 5 p.m. on weekends. The scenic drives will be open from 6:30 a.m. to dark, with the actual closing time for the main gate changing frequently as the sun sets earlier every day. Visitors will need to begin Red Sleep Mountain Drive by 6 p.m. to be able to finish before the main gate closes. This 19-mile, one-way gravel road takes about 1 1/2 to 2 hours to drive. The shorter Buffalo Prairie Drive takes about 20 to 30 minutes. If you are unsure about the opening or closing times of any of the scenic drives or the visitor center, please call (406) 644-2211 for further information. Please don’t be discouraged by our shorter operating hours. The weather turns cooler at this time of year, making wildlife more active and providing better viewing opportunities. Elk at the refuge begin bugling in early September, and visitors can sometimes catch action between rival bulls. Black bears are still out foraging, gleaning the last of the berries to put on fat for their winter sleep. Visitors should note that Red Sleep Mountain Drive will close for about a week sometime between Sept. 26 and Oct. 3 to allow staff to move the bison herd. During this time, the winter drive will be open for use with no fees charged. Red Sleep Mountain Drive will reopen through the next weekend but will close completely for the season after Oct. 9. Visitor center hours will also vary during this time frame. For safety reasons, we want to remind visitors to obey all posted signs, especially the “do not enter” signs when the winter drive is closed. So, come enjoy the last few days of summer or start off your autumn season with a fun fall trip to the National Bison Range. We encourage you to visit the refuge and take Red Sleep Mountain Drive a time or two before it closes for the winter season.